Uniquely designed cake toppers, hand painted to order right here in the USA, customized to you personally! Great for weddings, baby showers, and birthdays, our cake toppers are lasting keepsakes. 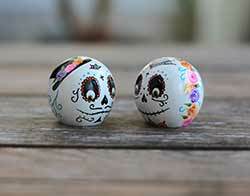 Perfect for the Day of the Dead collector or for that unique wedding, this custom Sugar Skull bride and groom couple is a unique piece of original art that will set your decor or special event apart! 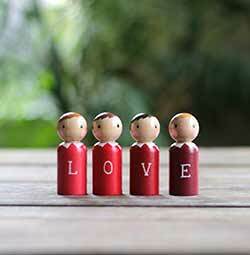 These simple and sweet boy dolls are perfect for Valentine's Day, and are sold here in a set of four shades of red for an ombre effect. Great for shelf or mantel decor, or as cake toppers! 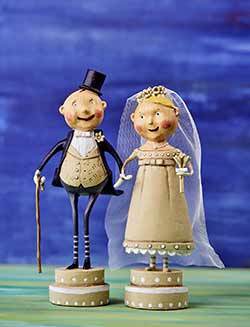 Add a touch of whimsical folk charm to your wedding with this darling bride and groom! Lucky Fella wears a black suit complete with top hat and cane. Wedding Belle has a gauze veil and holds a floral bouquet.